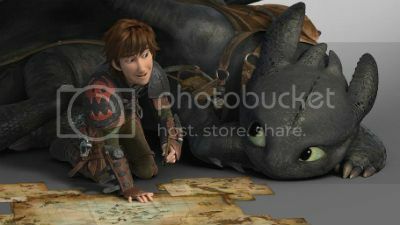 Five years have passed since Hiccup's last adventure and the gang are all a little bit older now. The explorer in him has taken over though, and on his quest to map the world he's run into some new adversaries. Much like the first movie I think this one is fantastic. The art is a little cartoony but having various and cute dragons who behave like a mixture of dog and cat is fun to watch. The humans of the tale also strike a chord making the entire movie engaging. There are cute bits, lots of action bits, plenty of funny bits, some sad bits and generally has something for everyone I would think. Just not so much training of dragons but I guess they needed to keep the title. I definitely recommend this to everyone, and give it four and a half fish out of five but also recommend you watch the first movie... first, because it sets the scene very nicely, and is in its own right a great movie. Would I watch this again? Yes! Legend of the Boneknapper Dragon - a mix of 3D and 2D cartoony stuff, funny but not movie quality. Book of Dragons - lots of reused 3D and mostly 2D cartoons. Again pretty funny but mainly aimed at child fans I think. Gift of the Night Fury - all 3D and fantastic, my favorite of this lot which I consider movie quality. Highly recommended! Dawn of the Dragon Racers - all 3D but I feel they skimped on the texturing a little. Still pretty good though. Have you ever read any of the books that the movies and series were (loosely) based on? I know that my kids liked them, but I preferred the movies. Today I Smiled: The Revenge of Blaugust! Mabinogi: What the hell G19?